A few months back, Microsoft released a new Platform Solution called Microsoft 365 . With a name like this, Customers confused the same with Office 365, which is a hugely successful Solution for Communication and Collaboration. The fact is Microsoft 365 is a much more enhanced Solution which has everything that Office 365 Business Premium offers, PLUS Enterprise Grade Security. You can also upgrade from Windows 7 Pro or 8 Pro to 10 Pro using this Solution. In this article, we will spend time to understand how a Office 365 Business Premium User can enhance his Security. 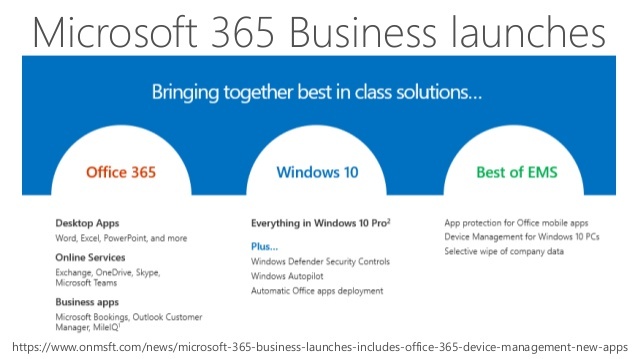 And if you are not a Office 365 User, then Microsoft 365 Business can give you complete Solution for Communication + Collaboration + Enterprise Security. 1) Proactive Detection of Security related issues. 2) Safeguarding your company data. 3) Protection Against Advanced Threats. 4) Mobility and Access from anywhere. 5) Actionable insight from data analytics. 6) a complete intelligence secure solution to empower employees. 4. Enforce Windows Defender Exploit Guard: Windows Defender Exploit Guard will be allowing you to manage and reduce the attack surface of apps used by your employees. 5. Enforce Bit locker encryption: BitLocker is Drive Encryption, a feature that allows you to use encryption on your PC's hard drive and on removable drives to prevent prying eyes from snooping into your sensitive data. There are many Customers who have taken our services to deploy and manage Microsoft 365 Business. One such case study is published on the Microsoft International website . Please click Acies Consulting .